Audiologists are often members of a team of health professionals that includes speech pathologists, physical therapists, occupational therapists, and physicians. Some work primarily with geriatric patients while others specialize in pediatrics. Median annual earnings, in 2015, were $74,890. In 2014, audiologists held about 13,000 jobs. Most of them work in audiology clinics, doctors' offices, and hospitals. Schools employ some. Most jobs are full-time positions and sometimes include weekend and evening hours to accommodate patients' schedules. According to the U.S. Bureau of Labor Statistics, this is a "bright outlook" occupation, a designation it has received because of its excellent job outlook. Employment is expected to grow much faster than the average for all occupations through 2024. To practice as an audiologist, you will need to earn a Doctor of Audiology degree or Au.D. This usually takes four years after first earning a bachelor's degree. The American Speech-Language-Hearing Association (ASHA) suggests that a candidate's undergraduate education consist of a strong "arts and sciences focus ... with coursework in linguistics, phonetics, psychology, speech and hearing, mathematics, biological sciences, physical sciences, and social sciences" (ASHA. Fact Sheet for Audiology). Not all graduate programs are equal. Do a bit of research before you choose one since some states will not give a license to an individual who has not graduated from an audiology program that is accredited by The Council on Academic Accreditation in Audiology and Speech-Language Pathology (CAA). You can check the licensing requirements of the state in which you want to practice before you select a school. Visit the American Speech-Language-Hearing Association (ASHA) website to see the state-by-state directory of licensing requirements and contact information. All 50 states have licensure requirements for audiologists. 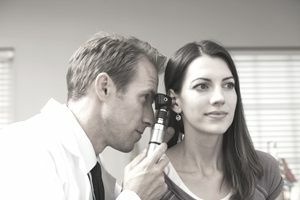 They vary by state, but, as discussed earlier, to become licensed, you will need a Doctorate in Audiology, and in some cases, it must be granted by an accredited program. ASHA offers the Certificate of Clinical Competence in Audiology (CCC-A), a voluntary certification. To be eligible to apply, you must have an Au.D. from a CAA-accredited program and pass the Praxis Exam in audiology, a national test administered by the Education Testing Service (ETS). Alternatively, you can, if you choose, get certified by the American Board of Audiologists (ABA). This voluntary certification stipulates that applicants must have a doctorate and pass a national exam. ABA also offers specialty certification in cochlear implants and pediatric audiology. Verbal Communication: You must be able to convey information, for example, test results or a recommendation for equipment or treatment, to your patients. You also need to communicate well with your colleagues. Compassion: It is important that your patients feel you care about their well-being. Interpersonal Skills: You must be able to establish rapport with patients and make them feel comfortable. Critical Thinking: Critical thinking skills will allow you to compare various treatment options and predict which one will have the best outcome. "Desire to educate patients about hearing and hearing loss." "Ability to work unsupervised or with minimal supervision." "Computer proficiency in word processing/typing, basic application and hardware functions." "Ability to follow instructions and base decisions on current policies." "The ability to interact professionally at all times with patients, physicians, and team members." "Desire to learn and upgrade clinical skills."